The PUI Project – Medellin | Beyond "he" and "she"
Medellin, once known as the murder capital of the world, is Colombia’s second largest city with approximately 3.5 million inhabitants. In the 1990s, Medellin had a murder rate of 380 per 100,000 people. Years later, the world’s most violent city is now San Pedro Sula in Honduras, with a homicide rate of 169 per 100,000, less than half the rate Medellin reached in its peak. Medellin has a complicated history of urban violence involving drug cartels, guerrillas, local militias and paramilitaries. Medellin was the hometown of Pablo Escobar and the base of the Medellin Cartel. The death of Escobar in 1993 increased the levels of rivalries and confrontation: the local mafias were up against the drug gangs, the guerrilla-backed militias against the anti-guerrilla paramilitary, the state security forces, the slum gangs, … Violence got to its highest point. In 2003, after Colombia’s security forces defeated the guerrillas and militias and a major paramilitary alliance disarmed in Medellin, a period of peace began reinforced by major urban reforms in the city. This period is known as the “Medellin Miracle” (Bahl, 2011). The homicide rate fell by more than 90%, from 380 per 100,000 to 180 in 2002, to 33 per 100,000 by year 2005. As a result, the city has been studied as a global model for successful transformation. In early 2012 Medellin won the world’s most Innovative City award and Sergio Fajardo Valderrama, the mayor of Medellin from 2003 to 2007, was awarded as the Curry Stone Design Prize, for his public works plan for the city (Curry Stone Design Prize, 2009). Is Medellin a proper example of great governance and successful development? This paper will discuss Medellin’s Development Plan 2004-2007 under Mayor Fajardo’s government and focus in particular in the Proyecto Urbano Integral or PUI (Integral Urban Project) in the slums of Medellin. We will present the PUI project, analyze its challenges, successes and limitations to draw on the different authors and theories we studied during the semester and conclude whether there indeed was a “Medellin Miracle”. The slums in Medellin, called Comunas, were for many years considered a city apart from Medellin, a place that “called attention to the importance of borderlines and margins as peripheries where inhabitants find themselves between inclusion and exclusion, legality and illegality, order and disorder, ruled and unruled” (Maria Clemencia Ramirez, 2011: 7). In this description, Ramirez is presenting a different Colombian territory, the Putumayo, but her view on the marginalization of a territory by its isolated geography, where the state has no control thus becoming an ambiguous space posing threats to the State, illustrates perfectly the history of Medellin’s comunas. The rapid industrialization of Medellin in the 1950s triggered an intensive migration from the coasts of Colombia to the city. The comunas were informally built in the 1960s on Medellin’s hillsides in the north of the city. These hillsides, that were too steep for vehicles, isolated the inhabitants of the comunas from the center of the city; going down to the city could take up to two-and-a-half hours. The comunas’ informal development resulted in high levels of poverty, exclusion, violence and insecurity. Death was part of the daily news and violence involved kids and young men that were in the middle of a war between local gangs fighting for control of the comunas. In 2003, after the mentioned major paramilitary alliance was disarmed in Medellin, the focus of the government was to regain control over the increasing violence in the city. The 2003-2007 Mayor Fajardo placed a particular emphasis on the re-integration of the comunas. The Proyecto Urbano Integral (PUI) is one of the main projects developed during the implementation of Medellin’s Development Plan 2004-2007 created by the Township of Medellin (Alcadía de Medellín) and the Enterprise of Urban Development (Empresa de Desarrollo Urbano – EDU). The project’s area of influence was approximately 130 hectares with a total population of 200,000 inhabitants involved, most of whom presented high levels of poverty (Calderon, 2008: 11). The diagnostic phase of the project was essential for its implementation. During this phase the area was thoroughly analyzed and its main problems and social opportunities where identified. To do so, several maps where developed analyzing roads and infrastructure; availability of land; existing public spaces and sidewalks; slope studies; land use; landmarks and centralities; and construction heights. This allowed the technicians and experts to have a greater insight and knowledge of the area. In parallel, social analysis was conducted that identified and analyzed community based organizations and representatives: Local action Committees, 110 community organizations (these going from youth groups to environmental ones) and 245 community leaders. Medellin’s departments of Culture, Social Development, Social Welfare, Social Works, Education and the Department of State were very active since the beginning of the project. These worked through programs of peace agreements with local violent groups and gangs, led a participatory planning, and contributed to the social analysis. All city departments worked together with the above-mentioned community leaders to be able to enter the space without getting rejected by the local people. This phase was essential to promote a sense of appropriation of the project by the local community. Additionally, it responded to the necessity of inclusion of social analysis in development planning and organization. For any development project, results support the need for social science to be involved at every stage of project development including policy formulation and project identification as Professor Gow clarifies in the main issues central to social analysis. He further stresses how crucial it is that the host country’s social scientists and social institutions are involved in any development project (Gow et al. 1989: 7). 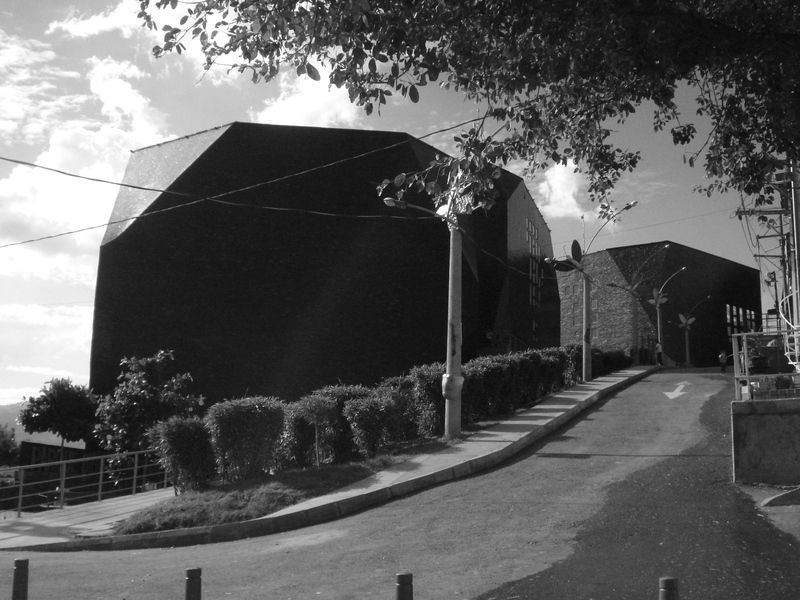 The PUI’s main objective was to implement a decentralized model of intervention based on an integration strategy of three components: a physical component including architecture and urban design projects, a social component based on the participation and appropriation of the projects by the local community, and an institutional component that would coordinate the existing institutions, agencies, and programs (Alcadía de Medellín, 2010). At the center of this approach was the improvement of public spaces and facilities, fueled by participatory processes and complemented by social programs. An important emphasis was set over the planning, design and implementation of the project to improve the public spaces, housing, roads and pedestrian infrastructure that were practically non existent in the comunas considering their informal formation (Calderon, 2008: 64-83). The project mission was to create a greater sense of community and propose a place for recreation, culture, education and leisure as an answer to the above-mentioned gang violence that involved kids and young people. Improving mobility, accessibility and connectivity between the different neighborhoods and the city aimed at the creation of better opportunities for people to work and access medical attention. The most important aspect of the program, in my opinion, was the participation and involvement of the community in the process. People from the comunas were involved in the decision-making and creating process, they were true actors in the process. This appropriation was done through the Community Committees, called the Talleres de Imaginarios Urbanos where problems and opportunities were identified in each of the areas of intervention. Once the projects were defined in terms of land and use, the physical and social component the community was asked what they would like these projects to be like. This was done via workshops where the whole community was invited (Alcadía de Medellín, 2010). During the construction of the projects most of the tasks were given to the people of the areas of intervention. All the construction tasks related to demolition of houses were given to members of the gang groups that had made peace agreements and were part of social programs (EDU, 2007). Approximately 90% of the labor force of the projects came from the area, generating around 3.400 new jobs. (Calderon, 2008: 83-90). This urban transformation was also reinforced by a new line of the Metro system of Medellin, which connected the highest part of the area with the existing metro of the city. This connection was made by an aerial tramway granting around 200,000 inhabitants of the area, a faster and free connection to the rest of the city. It allowed those once remote neighborhoods to start being recognized and seen as part of the city of Medellin (Alcaldía de Medellín, 2010) (Davila and Daste, 2011). Total public investment for the project during the period 2004 – 2007, was over $600,000 million Colombian pesos ($320 million US dollars). Although the PUI project was mostly funded by the local government, the city also received donations from other countries: Mexico donated money for one project along the city’s main thruway, Spain funded the building of the Spain library… Please refer to appendix 4 to see the details on the costs. The Parque Biblioteca Santo Domingo or Bilioteca España (Library Park Santo Domingo or Spain Library) that I visited in 2008. The library has 3 different areas for kids, young people and adults, public Internet centers, an auditorium, rooms for expositions, workshop rooms and daycare for children. It was selected as one of the 20 best projects of the continent in the Latin American Biennale of Architecture and Urbanism in 2008 (ArchiTravel, 2008). The growth of public spaces from 97,000 in 1950 to 222,000 m2. A 129% increase. The improvement of pedestrian mobility that grew from no formal paths to 3,235 linear meters of paths and corridors. 18 new parks, 8 of which were built in neighborhoods that had never had access to a park. The creation of the CEDEZO (Center for business development of the district) that supports small businesses of the area based on training, assistance, micro-credit and business events. The “Unidad deportiva de Granizal” (Sport Center Granizal) that turned an old run-down football field into3 new football fields, 6 retail shops and public bathrooms. The PUI intervention changed the way the city was perceived leading to significant social, spatial and economic revitalizations, while promoting inclusive patterns of urbanization. Besides job creations there were major inauguration events with the participation of people coming from all over the world. The inauguration of the Spain Library Park was performed by the King and Queen of Spain as guests of honor and principal donors of the project. Communication was key to promote the area and its transformation at the national and international level including institutional TV shows of the area, before and after videos and publicity. Also, every time a political committee from another country came to the city they were taken to the area. Up to 2007 a total 72 committees from other countries had visited the area, including the president of Brazil and senators from the United States of America (Alcaldia de Medellin, 2010). This opening of the comunas to international actors changed the image of the comunas as an inaccessible area of violence and promoted their inclusion as one of the must-see tourism spots. This resulted in the economic growth of the area and growth of local business. The Boulevard Andalucia Street 107 part of the comuna 2, for example, won 13,645m2 and became a commercial area, going from 18 retail stores to 239 owned by local people. Moreover, the Human Development Index (HDI) improved from 79.4 to 80.26 to 80.45 from 2004 to 2005 to 2006, the division by neighborhood is presented in the appendix 6. The Model is now implemented in other parts of the city presenting the same issues as the ones in the north of Medellin. Overall Picture – A true miracle? Despite the considerable achievements of the PUI, it is important to point out the limited influence of the project: only 2 comunas out of 13. The other comunas of Medellin present different consolidations and problems. The size of the comunas varies from 60 to 80 hectares and it might be inaccurate to generalize the issues and solutions of two comunas to a whole area. Further social analysis would be needed to identify possible different social problems of other comunas. Additionally, quantitative results cannot be evaluated accurately. If one compares the number of points in the HDI that increased in the comunas 1 and 2, to the ones of the other comunas, there is not always a significant difference. This can mean that the whole city had an overall increase of the quality of life in the period 2004-2007. The increase in the index cannot determine the real impact of the PUI project. In addition the scale of the project was small. PUI helped an area with only 200,000 inhabitants and might not be replicable on a bigger scale. This project did not solve all the problems of the city or all the problems of the comunas. Medellin is still World top 14 in homicides; there is still corruption, violence and the project did not eliminated the gangs or lessen their power in the comunas. While in 2007, the city recorded 771 killings for a homicide rate, lower than Washington’s, by 2011; it was back up to 1,649 homicides (Washington Post, 2013). Washington Post interviewed a gang expert, Luis Fernando Quijano, about the new rise of crimes in Medellin and he explained that the severe rise and fall in the rate suggest that “gang leaders may be fighting less, not that the state has control”. Quijano explains in this interview that more than 9,000 people fled their homes in 2012 because of crime and that the leaders of drug gangs remain on the loose. He states the Medellin never really made the decision to “strike a blow against the gang structures” (Washington Post, 2013). Despite its limitation, some achievements in education recreation and mobility appear to be significant. Is it realistic to use the label “miracle”? Probably not. The PUI model has been discussed as a possible guide of development. There has been a worldwide intention of scaling up the approach to other parts of Medellin and other cities in the world looking forward to replicate the Medellin “miracle”. The “PUI Concept” has become a common part of the discourse of many politicians and technicians who see it as a solution to every problem in slum areas. It is important to remember that there is no such thing as a magical model of development. “We don’t know exactly when we started to talk about cultural difference. But at some point we refused to go on building a strategy around a catalogue of “problems” and needs” (Escobar, 2011: 212). Arturo Escobar argues against development seen as a guide for the salvation of the other. I personally believe it is important to stress the limitations of such a project created in a local context that may not be replicable as a general framework for urban development. Did he tell us the story we wanted to hear? Maybe. But, either way, he knew the story, knew the benefits of the project, he was aware of the changes, moved around the facilities easily and you could tell he knew well the libraries and parks. He was part of the workshops and used the playground. Also, since we went there and did the tour with him, he got a few pesos out of his presentation! The simple fact of visiting the libraries and walking in the parks that were full of kids, in an area that was, 10 years ago, inaccessible because of violence and crime is good-enough evidence that the project did have positive consequences for the local people. Violence in slums can partly related for the lack of public space (Calderon, 2008: 10). What options did my little guide have before these installations were in place? Where would he spend his afternoon and how? This project improved the living conditions of the comunas of Medellin because it was built for and by the comunas of Medellin. It wasn’t an external intervention, it was development promoted from within. In this project, local community members were included and consulted from the very beginning which would confirm Gready and Ensor’s proposal to effect changes from within by identifying local social forms, communal practices and “collective metaphors” that will help change without an external coercion (Gready and Ensor, 2006: 273). In order to do that, it is necessary to create an engagement with local communities and local powers, which was the main focus of the PUI. The success of the project can also be analyzed through Beswick and Jackson’s method of analytic eclecticism, which consists in taking elements intentionally from different research traditions to illustrate and exemplify complex situations instead of simplifying a complex situation to fit a theory. (Beswick and Jackson, 2011: 146). The eclectic approach avoids the development of a scheme that has a narrowed view by asking only one part of the question. The most interesting part of the eclectic concept is the very simple rule of asking more questions; understanding the whole to focus on the particular, not the other way around. The Medellin PUI did a meaningful job in terms of asking these questions, understanding the local problems before drawing on any action plan. The project was built in parts to address local problems with achievable solutions. Exclusion was treated with better infrastructure enhancing mobility; crime was fought with social activities to promote education and human capital. Amartya Sen defines development as the enhancement of a population’s capabilities. Higher income can eventually lead to better living conditions, by facilitating social and economic opportunities in societies, but, focusing first on the capabilities will not only achieve economic growth but also a more equitable distribution of the additional income. In this sense, capabilities promoted through health, education and freedom of trade will positively influence economic indicators. By giving the people the tools to be capable and free, a positive result will result in the global economy. Amartya Sen formed his concept of development as the expansion of choice and opportunities to exercise personal agency (Sen, 2000). I believe the PUI project was all about agency and the creation of local capacities. This project followed a focus on local agency, the microenterprise forums and microfinance insertion along with training and better living conditions would result eventually in economic growth. Additionally, this was a project promoted by the local government. Gready and Ensor emphasize the importance of government in achieving a tangible local change and in breaking up the dependency by letting local institutions take control of a reconstruction process. PUI was targeted to a specific and small community “Overreach is a common consequence of the despaired goal of finding a global solution to poverty”. (Gready and Ensor: 29). Facing the lack of one universal humanitarian solution, development practitioners tend to defeat themselves by going too far and trying to solve too many issues at once. This project was localized and prioritized some issues over others not trying to solve all Medellin’s problems at once. Our cornerstone midterm project was based on the lessons learned on development. I would like to draw down on the summary of the main lessons I learned to link them with the PUI model. 1) Test the project before applying through a feasibility study in order to avoid the expenditure if the project is not feasible in a specific context. Monitor its development. The diagnostic phase of the PUI model took a whole year. This ensured the area was ready to reactive the project when it was implemented. 2) Use the eclectic analysis to understand any project of development. As explained, this project was made specifically for the comunas of Medellin including the local people. 3) Focus on context: the people, local communities and local government should be a key part of the project. This was a project led by the local government. Workshops worked to include local communities and make the project their own. 4) Understand the local culture that should be seen as “an inseparable notion of development” (Schech and Haggis). The issue of the space was directly linked with the local social need. Parks and libraries instead of guns and drugs? Sounds too simple but it works. At least to some extent. 5) “Use technology to both study and understand the culture and to reach more people”. Metrocable was a critical component of the development of the PUI model providing local people with access to the city and opening this area to external visitors. To conclude, I realize there are still many socio economic issues to be addressed in Medellin before presenting the city as an accomplished “miracle”. However, although it is important to understand the limitations to a local context, the PUI represents a successful development project that responded to the definition of development I outlined from the lessons and readings studied this semester: “Development as a practice in social learning, not static and in constant evolution” (Nederveen Pieterse: 37, 98). Development, as Amartya Sen describes it, the expansion of choice and opportunities to promote local agency. And, as explained by Schech and Haggis, not only culture at the center of the understanding of development but also development itself is considered as a cultural process. Thank you!!!! Where was the project from your thesis? Do you have anything about it on your blog? No I don’t have any on the blog. I did case studies mainly from Curitiba, Brazil and then there were few other smalled cities as well. it was quite interesting..